Explore the Underwater World of the St. Lawrence Seabed Without Getting Your Feet Wet!! PrintBackExplore the Underwater World of the St. Lawrence Seabed Without Getting Your Feet Wet!! Located in Sainte-Anne-des-Monts along the St. Lawrence River, Exploramer has the mission to introduce visitors to the ecosystem of one of the most fascinating rivers in the world, the St. Lawrence. I’ve already visited most of the museum’s exhibits and I like how they explain marine phenomena using videos, interactive modules and hands-on workshops. Family members of all ages can learn while having fun! During each of my visits, I appreciated the explanations provided by the naturalist guides on site who helped me better understand the marine species that live in the waters of the St. Lawrence. I also think that they’re the ones who make my visits to the museum so interesting: their enthusiasm and passion are contagious! 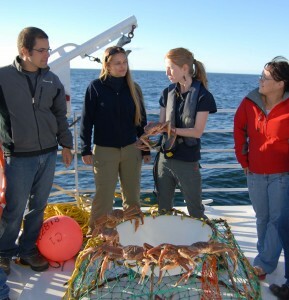 If you have sea legs, you’ll want to participate in a sea excursion during which naturalist guides will introduce you to various species of the St. Lawrence by hauling up the traps strategically placed along the coast and then carefully putting the marine organisms back into the water once they’ve introduced them to you. This year, Exploramer is also offering a new fish harvesting activity near the shore. I already know that I’ll try this activity during my next visit. I’ll tell you all about it soon! I highly recommend a visit to Exploramer to learn more about the hidden treasures of the St. Lawrence. And who knows, maybe we’ll run into each other there! For more information about other maritime museums in Québec, please visit the website of the Société des musées québécois. Visit Maritime Museums This Summer!